We found this skull in a box with the three vertebrae bones sitting next to a dumpster on one of our daily walks with the pugs. It was just too weird, I couldn’t resist the challenge of making it into something fun for the Chic Rock Star Glam bedroom make-over so I grabbed it. (I couldn’t just leave it all grungy, so not my style). I cleaned it up and gave it a light sanding, along with the three vertebrae bones. 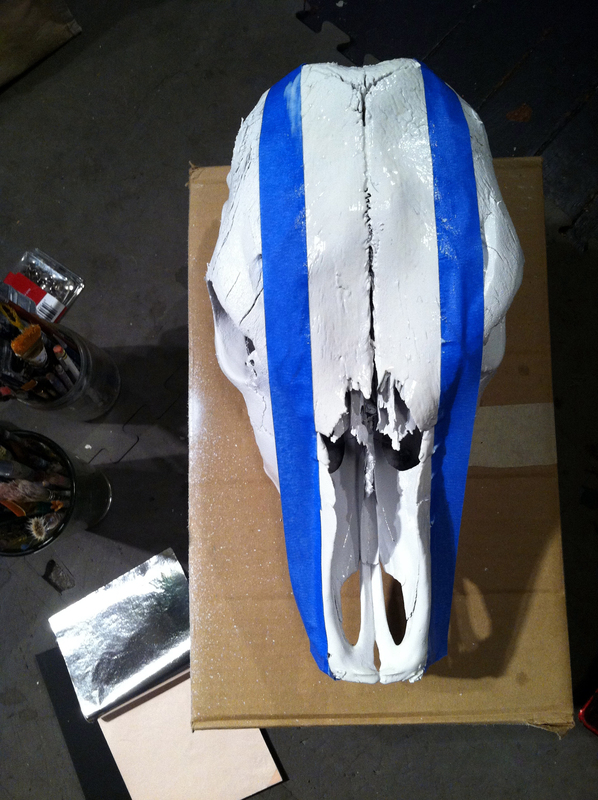 Grungy skull, ready to paint. After a coat of Kilz primer, I painted them with 4 coats of white gloss paint. 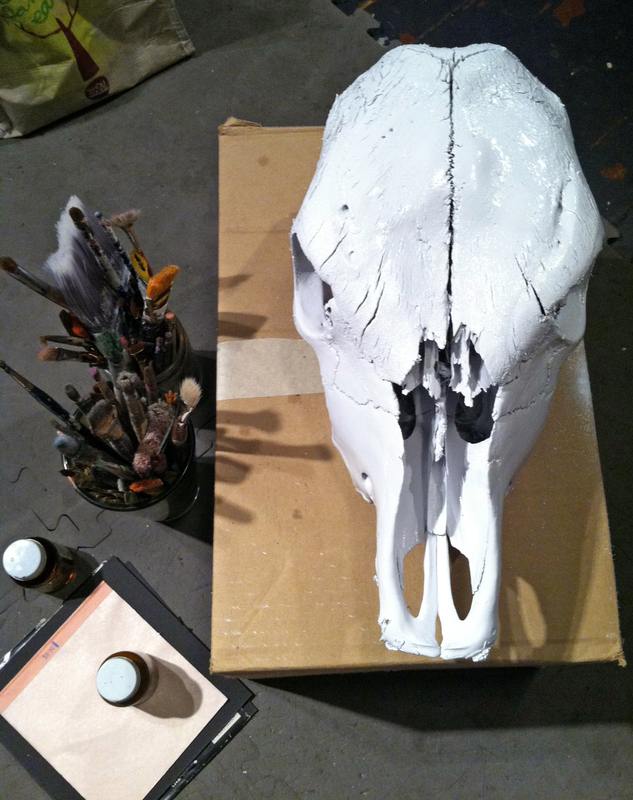 Cow skull painted white, ready to decorate. 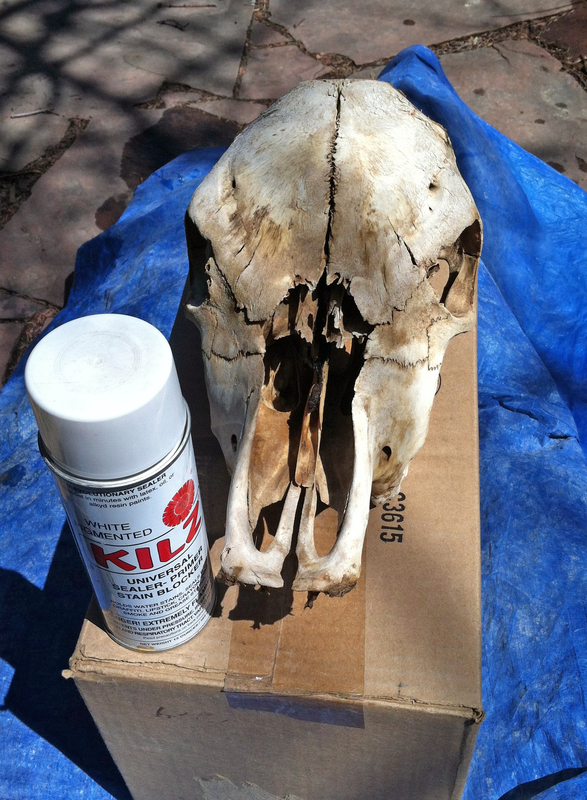 Then I pulled out all my crafty stuff (I have boxes and boxes of fun things I’ve picked up at yard sales, thrift stores and auctions over the years) and played with a design for the skull. I decided to do a silver-leaf stripe down the front and add some fun glass copper-wrapped jewels (I have a box full of these from artist Lonnie Hanzon‘s art studio auction I went to years ago) The three vintage glass flowers also came from Lonnie’s auction. I attached the jewels with Duco cement, but any good heavy duty glue should work, even a hot glue gun. 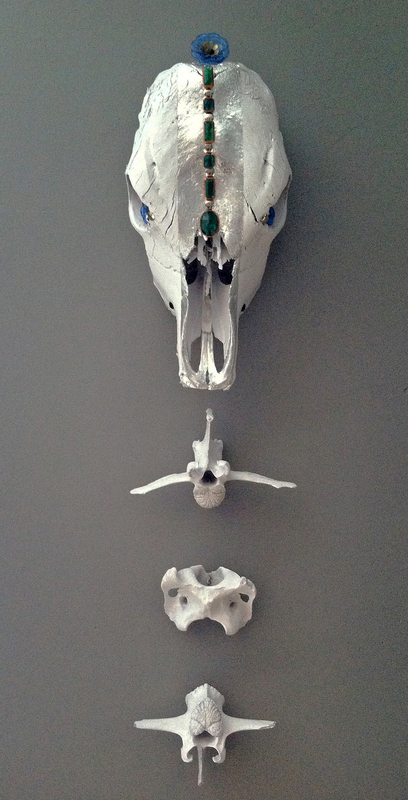 After the glue set, I attached picture wire to the back of all the bones and hung them in the new bedroom. Because I had most of the items on hand, I only paid $5 for the can of spray paint, but I estimate I paid about $4 for the rest of the jewels and what-not, so the whole project cost less than $10. And here it is! 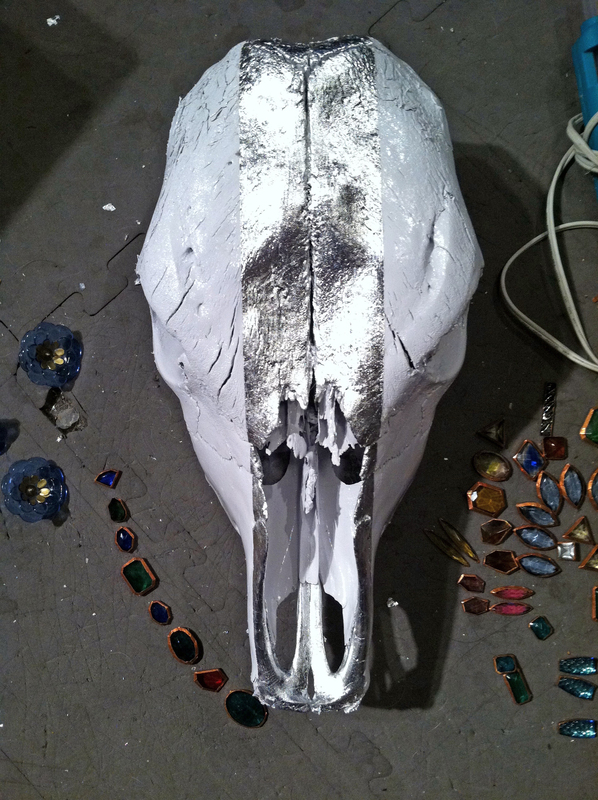 Funky Cool Chic Cow Skull, well, as chic as a cow skull can get I suppose. Sort of a glam Dia De Los Muertos thing. Looks great in the Chic Rock Star Glam bedroom. I hope it inspires your next creative project! Pictures of the bedroom make-over coming soon! Just a few more projects to go before the Big Reveal. Stay Tuned! 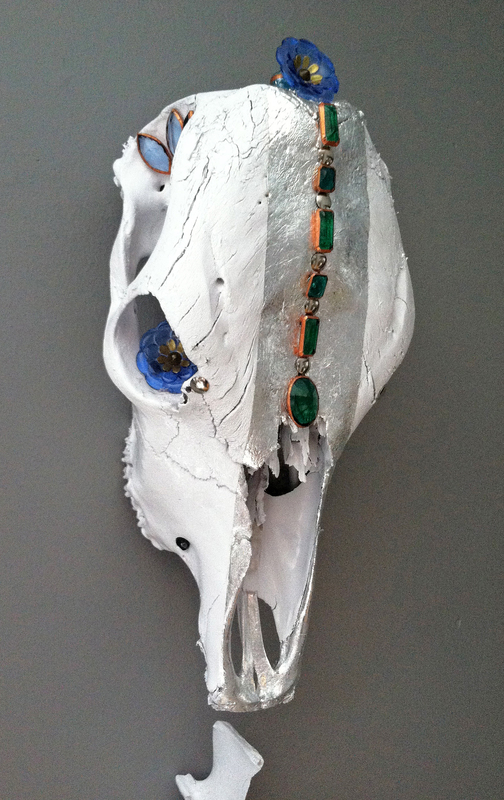 This entry was posted in art, decorating, DIY, home, lifestyle and tagged art project, bargain hunting, bedroom, bedroom makeover, bedroom remodel, best for less, bones, budget, cow skull, decor, decorating, dia de os muertos, DIY, lifestyle, lonnie hanzon, metal leaf, personal style, redecorating, redo, restyle, rock star bedroom, saving, silver leaf, skull. Bookmark the permalink.